Having recently finished Pauline B. Jones’ science fiction romance GIRL GONE NOVA and her steampunk romance novella TANGLED IN TIME (both released by L&L Dreamspell), I wanted to learn more about the creative mechanisms behind the stories. The more I read, the more I realized the author had created an extensive universe for this series. It’s a mix of military space opera, time travel, romance, action-adventure, and steampunk. If you think that’s quite a lot going on, it is, hence I invited the author to chat with me about her work in more detail. The Galaxy Express: Having recently read your science fiction romance GIRL GONE NOVA as well as your steampunk novella TANGLED IN TIME, I’d like to chat with you about the universe you’ve created, one that began with THE KEY. First, let’s talk about the world. Clearly, you went to a lot of effort to create a fully realized one. As a whole, and without spoilers, how would you describe the universe the characters inhabit? What can readers expect from the setting? The most dangerous and troublesome (for characters AND author) is the time/space portal, of course. When I started GIRL GONE NOVA, I was not going to go near time travel. I’d written a time travel once before that made my head ache figuring it all out. GGN, on the other hand, almost made my head explode. I fought the plot for too long, finally relaxed and turned it loose and had a great ride with it. Of course, the great/challenging thing about time travel, and the repercussions of it rippling back and forth in time, is that it makes for lots of interesting conflicts and challenges for characters (and author) to overcome. I have conceded this battle, though, so there will be more time travel and we will find out what the deal is with the mysterious Dr. Smith and meet an aspiring Evil Overlord. He might even get defeated. I haven’t managed that part yet. He’s a wily and wicked aspiring Evil Overlord, but I’m sure my characters will triumph. Or my head will explode and my heirs will have to figure out how to end it. TGE: If readers were to ask me if any of the books can be read as stand alones, I would actually recommend they start with THE KEY since some characters appear in more than one book. Plus, there are plot threads that have the potential to be explored in future stories. But that’s just my take as a reader. What’s your perspective? 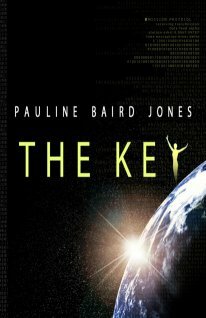 PBJ: I try very hard to make each book able to be read as a standalone, but I do think readers will enjoy the experience more if they start with THE KEY. One of the hardest things to do is present enough back story for clarity without spoilers of previous books. I tend to go scant on the back story, but I will admit, it is getting harder as the series progresses. In particular, GIRL GONE NOVA, TANGLED IN TIME, and my in-progress novel are much more connected as an over arching story line plays out. But each story does (and will) have an ending. I don’t do cliff hanger endings because they annoy me. Did you originally intend to start a series, or was it more lucky chance that you were able to write spin off/continuing stories? Oh, definitely lucky chance. Prior to this series, most of my books were stand alone. I did have a loosely connected three book series with three brothers, but the family relationship and the lawmen angle were the only connections between the three stories and novella. There was no cross over in the plots. When I wrote THE KEY, I was just following my muse, but as I got near the end, I found myself reluctant to leave it. I liked outer space and wanted to keep “playing” there. For one thing, the shoot outs and explosions can be MUCH bigger and the black moments are a lot blacker in space. I looked closer, started asking a lot of “what if” and “what are you up to” questions and realized I had a story arc that needed more room to develop. One thing that struck me about the stories was how much they involved the alien artifact trope. I’ve been a fan of that trope very much over the years. What inspired you to incorporate such elements into your series? What kind of alien artifact books/films/shows have you enjoyed? I will admit I got the idea from the Stargate TV shows. I love the idea of unintended consequences and the “oops” moments that come from pushing something you shouldn’t or stepping through a doorway (or into a wormhole!) before you know what it will do. Alien artifacts are like “Paint, don’t touch” signs. You know you shouldn’t, but you do it anyway. And then these wonderful complications and problems spin out in interesting ways that require your characters to rise to challenges and shoot at bad guys, and blow things up, and win the day. What could be more fun than that? It’s also very “fish out of water-ish” and I’ve always liked that trope, too. TGE: I also think it’s important to mention that this series involves time travel elements. However, the device plays an integral role (as opposed to the device being just a catalyst for a romance). Based on the nature of the time travel involved, who would you say is the audience for this series? This is an “If you like…” question I’m thinking of here. PBJ: My core inspirations (way back when I was germinating as an author) were Alastair Maclean (loved his over the top action, the twists and turns), Elizabeth Cadell (good characters and a sense of humor), Georgette Heyer (awesome characterization and plotting) and Mary Stewart (nice blend of suspense and romance). You will notice there isn’t an SF or SFR author there and I feel that lack keenly. I feel like I have a lot of catching up with the other SFR authors in “talking the talk” and navigating the tropes. I did have a reviewer compare THE KEY to a Linnea Sinclair and I thought that was a wonderful compliment, because she is my favorite SFR author, hands down. Did I mention I really like her books? (grin) As I’ve been working my way through the 100 Must Read SFR list from this blog, the books are so diverse and so individual, it’s hard to say, this book is like that, or that book is like this—which is probably how they ended up on the list. Really good storytelling, IMHO, makes readers go hunting for books “like that,” but in my author hat, I sort of hope they don’t find one just like mine. LOL! TGE: One advantage of science fiction romance is the freedom to create a variety of cross-genre stories. In your case, you began mixing steampunk with military SF space opera. At first glance, the mix seems oxymoronic, but I felt that the steampunk elements in TANGLED IN TIME felt pretty organic to your existing universe. Given the above, would you conceptualize TANGLED IN TIME as more of a bridge story, a “side story,” or something else altogether? PBJ: It’s definitely a bridge story, though it was intended to be a short, stand alone story in an anthology (and I think and hope it can be read and enjoyed all by itself—though I hope readers won’t stop there). My target length was 7,000. When I hit 6,000, I knew I was in trouble, but some people were submitting two stories, so I thought, okay, 14,000 and then I blew past that. It stopped short of being a grown up novel (much to my editor’s relief! ), so will release as a novella. What was fun, and what turned it into a bridge story, was when the mysterious Dr. Smith turned up. I wasn’t expecting that. I was even more surprised by what he was after and why (you have to read it to find out, which is mean, I know!). But that built the bridge and launched the next novel in the series, which is also a mix of SFR and Steampunk. I love that I can do that. I love that I can gather up the various genres and sub-genres like a handful of dice, roll them, and create new patterns, and even sub-sub-genres. And I’m glad I have an independent publisher who is happy to let me roll the dice—even really odd dice. TGE: Speaking of military SF, there’s a lot of that element in these books as well. I learned a lot of cool-sounding military lingo! What kind of research did you do for that aspect of the series? PBJ: Obviously, doing a lot of research about SF and time travel wasn’t possible (though there are a lot of time machines available for sale in various places—untested, of course). I did do some general searches on the internet that netted some… interesting stuff about alien incursions. I also had a NASA scientist as a beta reader. She was awesome and helpful and one of my other beta readers is a long time SF author with great instincts. It was kind of funny, because I did more research about the US Air Force than any other element in the book. My Earth ships are AF and I wanted the characters to sound like AF, though with the whole SF twist. I happened onto to the slang site that was very fun (but I had to only use stuff where I could use context or have reasonable reason to explain what it meant). I also got a lot of help from my son, who was exploring ROTC when I wrote THE KEY. He’s the one who pointed me toward the SERE training, for instance. I still run my battle and fight scenes past him and he usually has a suggestion for more fighting or exploding, which you may have guessed that I like. TGE: Doc, the heroine in GIRL GONE NOVA, is very much an “extraordinary heroine” in my opinion, in the sense that she has special abilities. Also, she owns guns and isn’t afraid to use them (yeah, baby!). But that’s just me. How would you describe her appeal as a romance heroine? PBJ: From the comments I’ve received, and from some of the reviews, I think it is the combo of her strength and her weaknesses that make her appealing, and the journey we all make in discovering who we are and how we fall in love and how that changes us—or that’s what I hope! I like the “real girl” comment, because for Doc, that is her internal journey: from extraordinary to her version of normal. One thing I do know, from years of contact with extraordinary/ordinary women, they may not travel in space, but they overcome their obstacles and deal with their trials with courage and humor. I try to ground my characters in that place, because they are, IMHO, real life romance heroines. And I hope that is what resonates with readers when they read her story. TGE: We’ve covered a few of the major elements that make up your series, but is there anything else you feel potential readers should know? Where can they find your books? Aww, shucks! Thanks for coming aboard.